I enjoy preparing meals for my family, not only is it cheaper than dining out, for the most part it is healthier and has better flavor. I know families get in ruts and eat the same things over and over, well for me it is just the opposite. We have a few favorites, but I try at least one, but a lot of times more than one recipe a week thanks to Pinterest . Although variety is great, I sometimes make things that my family likes and never repeat it! I need to do a better job of documenting what we like so I thought I would include you. Every couple of weeks I will give you a review of something we have tried. I will be commenting on the ease of the recipe and availability of ingredients, the taste, how I may have changed it, (I do this all of the time! ), and if I would recommend it for guests. So let's get started. 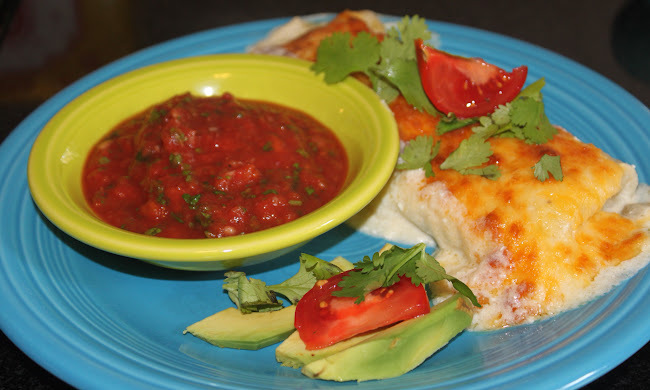 We love Tex-Mex so when I saw this recipe for sour cream chicken enchiladas at Joyful Mommas Kitchen I knew I wanted to give it a try. This recipe was super easy and the ingredients were all something that I generally have on hand, except for green chillies and I just buy those as needed. Chicken enchiladas with sour cream sauce is something we order when eating out and these were every bit as good as most places I have eaten. I used chicken breasts that I cooked in my pressure cooker. I always cook quite a bit at one time for more than one meal. I only made five enchiladas because I had five flour tortillas on hand and they were burrito size so they were quite large. The only other change I made was I added some extra cheese! I used real sour cream because that is what I had, but next time I will try greek yogurt. Mr. Wonderful and I enjoyed ours with fresh avocado, a little sprinkle of cilantro and tomatoes. We also had homemade salsa (recipe here ). I would definitely serve this to guests with the salsa, rice and beans restaurant style! Hop on over to Joyful Mommas Kitchen and give it a try, I think you will enjoy it as much as we did!